The maiden visit of a new ship is always of interest, and Friday's arrival of the Sietas Type 151 containership VICTORIA was made even more so as she was on the first voyage of a new service too. Having left Southampton on Tuesday, she called at Avonmouth before heading up the Irish Sea to the Clyde. 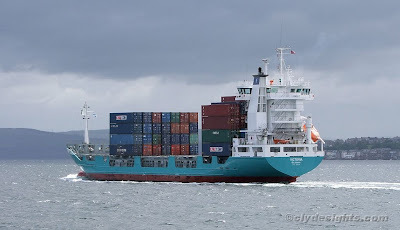 VICTORIA is on charter to CMA CGM and will operate between Avonmouth, Greenock and Le Havre on the West Coast Feeder 2 service running on a weekly basis, and connecting into her charterer's worldwide network at the French port. She was built at Hamburg and completed in February 1998 as RIJA. Renamed in July 2007, VICTORIA is 101.1 metres oveerall, and has a deadweight of 5,200 tonnes. She can carry 508 TEU containers. Before going alongside, VICTORIA had to anchor to await a berth, as both ACHIEVER and X-PRESS MATTERHORN were alongside Ocean Terminal.